Table Tennis is one of the most popular recreational sports because the need of table tennis equipment is very little. You’ll only need a racket, ball, and a table to get started. Since this sport is so popular and so many equipment manufacturers out there, it’s very easy to get confused. When you need to buy any table tennis equipment, you’ll see that a lot of products are available. You’ll end up faced with a bewildering array of choices. If you are new to this sport, it can be very difficult to determine which equipment is the right for you. And that’s why we have created this guide to determine the right equipment to enjoy the game of table tennis at its best. Our team of researchers is here to help you pick the right equipment. Sit back and spend a few minutes to read the rest of this article. We will guarantee by the end of this article, you’ll end knowing exactly what you need to buy. Before you buy anything, you need to know what characteristics you should look for. You need to ask yourself some certain questions before buying any equipment. 1. Do you need expensive equipment? The answer to this question depends on your standard of play. If you are beginner it’s better to start with low to mid-budget equipment. As your game gets better, you can opt for the more expensive equipment. If you are a beginner, it’s recommended that you start playing with simple and inexpensive equipment. It’ll be easy if you know how to pick the right table tennis paddle. We’ll be featuring an article on that topic soon. Like any other game the more you play, the better you get. That’s how table tennis works. You’ll soon realize that you are in need of better equipment. 2. What Equipment Do You Need? A table tennis table with a net. As you get better in this game, you’ll find that there’s a vast array of other equipment you’ll need to buy. You’ll need to find some suitable table tennis clothing. You do need to look good and smart while playing this game. A good pair of table tennis shoes. If you want to set up a club, you’ll need other accessories like a net, ball picker, scoreboard, barriers and possibly a table tennis training robot. Let’s have look at each of this equipment. The first thing you should pick is the right set of table tennis paddles or table tennis rackets. It doesn’t matter what you call them. The choice of picking the right table tennis paddle is one of the most important decisions you’ll make. Your style of play depends on your choice of racket. It’s important to choose the right bat from the start. I repeat it’s very important to choose the right one that’ll complement your style of play. It’ll also determine how you will develop as a player. You don’t have to worry about picking the wrong paddle because we will be featuring an article about table tennis paddle buying guide pretty soon. We like to call them Ping-Pong balls because that’s where the name “Ping Pong” came from. Want to know more about Table Tennis history? Check out our History Of Table Tennis article. This game has a pretty interesting history. You might want to check that out. Enough of history, let’s get on with our topic. Table Tennis balls or ping pong balls (whatever you call them, it doesn’t really matter) are cheap. They come in many different varieties. So, it’s better to know what to look for before you pick the right ping pong balls. We’ll be covering the best ping pong balls pretty soon. We are already working on a buying guide for picking the best table tennis balls. You might be wondering, why go to such extents to pick a simple ball? Actually, it’s not that simple. 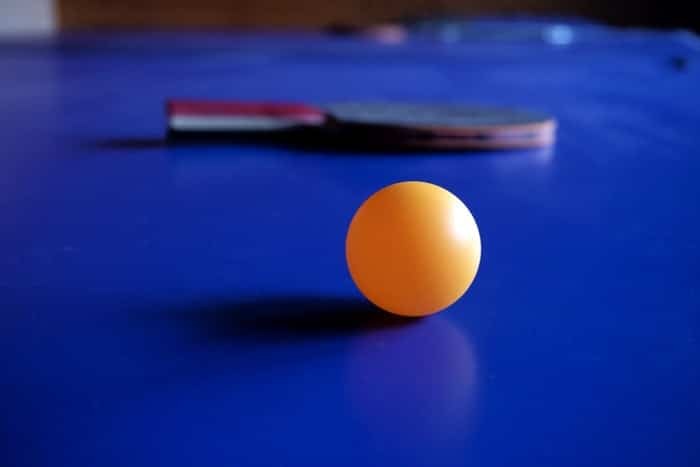 Since table tennis was first introduced the only problem manufacturers faced was due to table tennis balls. Over time a lot of improvement came, Table Tennis Balls have changed. The old celluloid balls are no more. They were replaced by plastic balls. There is also the difference in star rating. Each represents a different purpose. We’ll talk more about table tennis balls in another article. Table Tennis Tables are expensive. It’s all about picking the right one. There is no such thing as best table tennis table. If you want to simply enjoy a game of table tennis with your family, then go for the inexpensive ones. A lot of us want a table for a bit of fun with family and friends. There is no reason to buy expensive tables for that. The cheap ones will do just fine. But if you are looking to take this game more seriously, then choose wisely. You’ll certainly be disappointed if you pick the cheap ones. There’s a lot to consider before buying the best table tennis tables. There are indoor tables and outdoor tables. You need to know the basic differences between them. There are also other types of table available like conversion tops, mini, novelty, full-sized, floating pool table, tables for beer pong etc. You’ll also need to know the basic of the undercarriage and top surface protection. Told ya, buying table tennis equipment aren’t that easy. But we are here to make things as simple as possible. Stay tuned, bookmark this page for upcoming articles. To make this game more interesting and enjoyable, there is other equipment you should consider buying. There are table tennis nets, ball picker, table tennis paddle case, table cover for protection. And finally, if you are looking for a training partner or improve your skill at home, you can check out our table tennis robot article. Wearing proper table tennis shoes are also important. Check out our table tennis shoes for more information. And that wraps it up. Hope you enjoyed our table tennis equipment article. Leave a comment below and don’t forget to share.